Home » Politics & Government » This Is Peaceful? Let’s see, what do we have here? 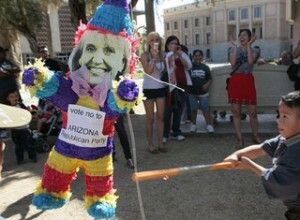 Why, that’s an image of Arizona Governor Jan Brewer dressed as a pinata. The sign says “Say no to Arizona Republican Party.” There’s a young boy ready to swing at her with a bat, while others in the background are enjoying the sight. No violence here. No disrespect for authority. It’s all in your imagination. 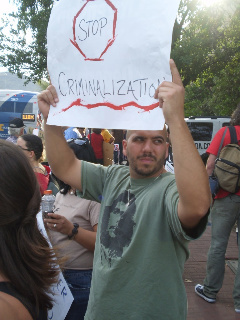 Here we have a demonstrator against the new Arizona law that seeks to identify illegal aliens. He’s outraged. 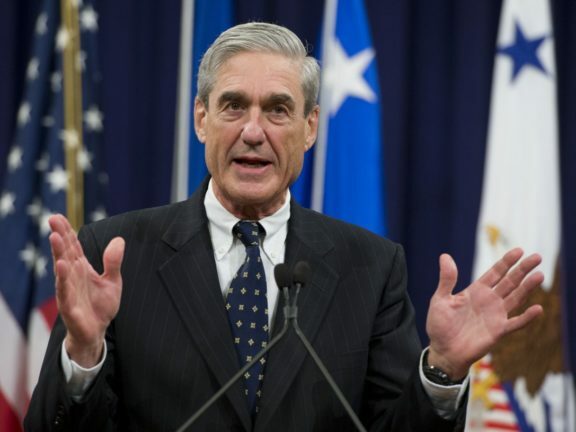 Why should anyone doing something illegal be prosecuted? Why, if a society started doing things like that the rule of law might prevail. What a horrid thought. Notice his interesting shirt? It has the image of Che Guevara, Castro’s comrade in revolution who was just as much a mass murderer as his fearless leader. This is the face of those who oppose the new law? I wonder if this protester has the same ideology as Che—totalitarian Marxism? When news came of the signing of the bill, the protests turned ugly with the crowds shouting and throwing things at the police. The political Left has gone ballistic. They are comparing the law to the Nazi holocaust of Jews. . . . Yes, you heard that right. Let’s see: Hitler murdered 6 million Jews in his concentration camps; the Arizona law checks on suspicious individuals who might be in the country illegally. Yes, I guess those are about the same. You always know when something is a little bit looney if Al Sharpton shows up. 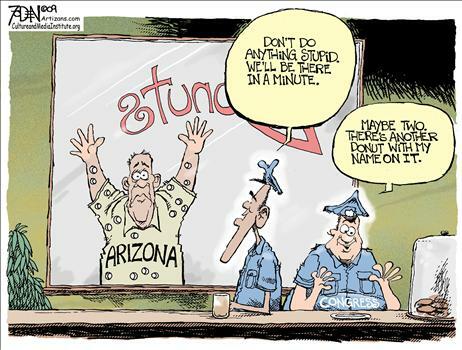 Meanwhile, 70% of Arizona’s citizens [you know, the people who live there legally and can vote] approve of the new law. Their reasons have to do with certain salient facts about the dangers posed by illegals committing crimes in the state. Not too long ago, one rancher was killed as he tried to protect his property from illegals. 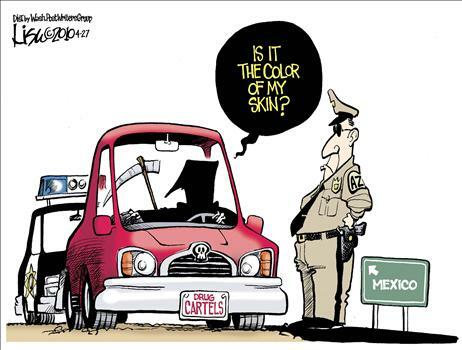 No one is saying that all illegals are criminals. In fact, the law does not send out the police to round people up. It merely enforces existing law in lieu of the federal government taking its responsibilites seriously. Phoenix has the second-highest kidnapping rate in the world due to illegal immigration and human smuggling. 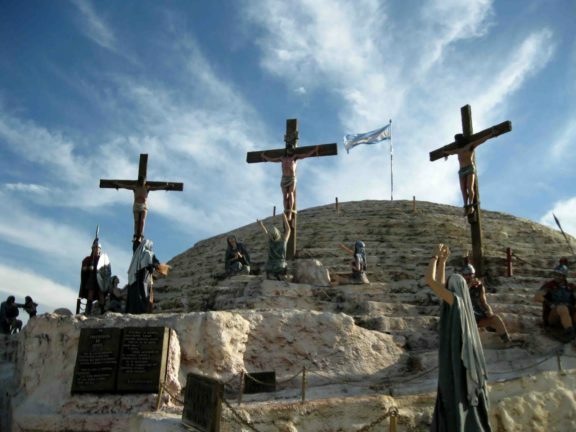 The activity is spurred by Mexico’s drug cartels and has led to an increase in violent crime in the city. Yet the protesters, as has become the norm, have made this into a racial issue. 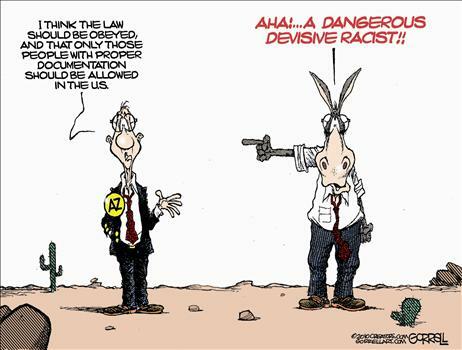 Yes, I know, it should be “divisive” [I didn’t draw the cartoon]. How has the media handled the reaction to this new law? Why, those are peaceful protesters with legitimate grievances! They’re not like those hateful Tea Party people who are always threatening to kill and destroy! What’s that? You say there hasn’t been any violence at a Tea Party rally? You say that people of all ethnic backgrounds are welcome and do participate? 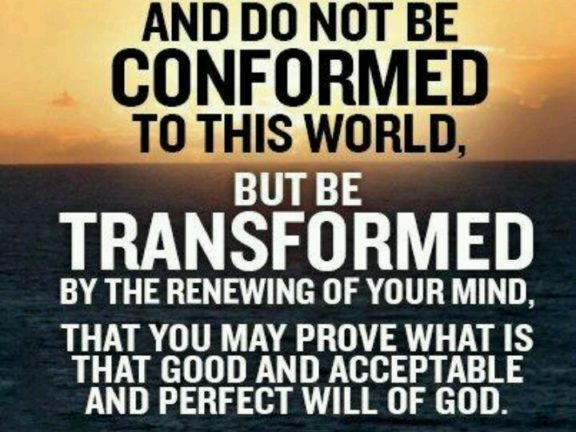 Tell that to the mainstream media.